Volkswagen is today announcing the launch of the T-Cross First Edition – the initial iteration of the brand’s practical new compact SUV. This exclusive First Edition model is reserved for the first 250 UK customers of Volkswagen’s newest model, and appears ahead of the full T-Cross range opening for order in March. The T-Cross First Edition gets a suite of equipment upgrades including a beats® sound system with 300-watt output and an extra subwoofer; Discover Media satellite navigation; and LED headlights. Each of the exclusive 250 First Edition models will be finished in Pure White with silver roof rails and unique black styling throughout, with 18-inch ‘Funchal’ Adamantium alloy wheels. An exclusive decal on the car’s C-pillar further marks out the First Edition. Front Assist including autonomous emergency braking, blind spot sensors, adaptive cruise control and Lane Assist all featured as standard. Practicality is high on the newcomer’s list of talents with sliding rear seats fitted as standard, allowing an additional 70 litres of storage capacity, or up to 140 mm of extra rear leg room. The T-Cross First Edition represents a value-packed launch of the new T-Cross in the UK, with an extensive standard-fit equipment list applied to all 250 examples. Volkswagen Retailers will be accepting orders for the new model from 5 February, with the first cars of the 250-vehicle run arriving on UK roads in April. 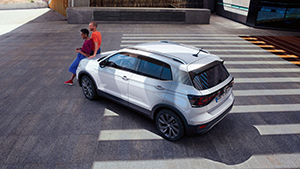 T-Cross Product Manager Claire Haynes said: “The T-Cross is an exciting new addition to the growing Volkswagen SUV range, and there’s no better way to introduce it to the UK than offering something even more special to early customers. ACTUALLY, the very first NSU/Wankel RC engine ran, and produced measurable power, albeit only in short spurts, on February 1st 1957. Golf Mk6 2.0 Remapped - Too much torque? Recently got my golf mk6 2.0 140 got remapped. The company quoted 190bhp with 420nm of torque. Cool - does that get more rapid with revs? Assume so. Weird one, changed rear pads and noticed that the top bolts had a weight on them where as the replacement bolts didn't have them. Sounds like the loom for that corner isn't connected properly. Have you tried a gearbox reset? I wonder if this might help? How and where do I check the oil? Can I remover the oil pressure switch and install a oil pressure gauge there?